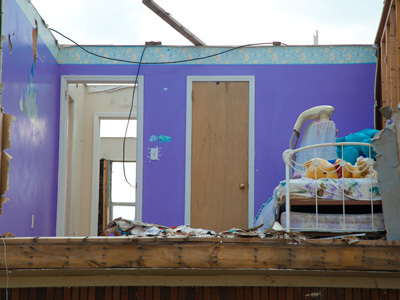 The remains of a bedroom destroyed by a tornado that struck a neighborhood on Lamplighter Lane on April 27, 2011. Birmingham, Alabama, July 23, 2011, 4:39 p.m., Canon 5D Mark II, EF 24-105 mm f4.0L IS USM, f/8, 1/500 sec., ISO 400. Photo by Christopher Mardorf / FEMA. A home destroyed by a tornado that struck a neighborhood on Lamplighter Lane on April 27, 2011. Birmingham, Alabama, July 23, 2011, 4:50 p.m., Canon 5D Mark II, EF 24-105 mm f4.0L IS USM, f/9, 1/320 sec., ISO 400. Photo by Christopher Mardorf / FEMA. Bathroom toilet and debris left after a tornado struck a neighborhood on Mildred Ave. in Pratt City on April 27, 2011. Birmingham, Alabama, July 31, 2011, 7:24 p.m., Canon 5D Mark II, EF 24-105 mm f4.0L IS USM, f/6.3, 1/250 sec., ISO 800. Photo by Christopher Mardorf / FEMA. An apartment building destroyed by a tornado that struck a neighborhood on Cherry Ave. in Birmingham's Pratt City on April 27, 2011. Birmingham, Alabama, July 17, 2011, 2:37 p.m., Canon PowerShot S95, f/4, 1/250 sec., ISO 80. Photo by Christopher Mardorf / FEMA. Second floor of home destroyed by a tornado that struck a neighborhood on Lamplighter Lane on April 27, 2011. Birmingham, Alabama, July 23, 2011, 4:20 p.m., Canon 5D Mark II, EF 24-105 mm f4.0L IS USM, f/9, 1/250 sec., ISO 400. Photo by Christopher Mardorf / FEMA. Homes destroyed by a tornado that struck a neighborhood on Cherry Ave. in Birmingham's Pratt City on April 27, 2011. Birmingham, Alabama, July 17, 2011, 1:46 p.m., Canon PowerShot S95, f/4, 1/1000 sec., ISO 80. Photo by Christopher Mardorf / FEMA. A home's plumbing fixtures destroyed by a tornado that struck a neighborhood on Mildred Ave. in Pratt City on April 27, 2011. Birmingham, Alabama, July 31, 2011, 7:27 p.m., Canon 5D Mark II, EF 24-105 mm f4.0L IS USM, f/5.6, 1/250 sec., ISO 800. Photo by Christopher Mardorf / FEMA. Home destroyed by a tornado that struck a neighborhood on Mildred Ave. in Pratt City on April 27, 2011. Birmingham, Alabama, July 31, 2011, 7:26 p.m., Canon 5D Mark II, EF 24-105 mm f4.0L IS USM, f/8, 1/125 sec., ISO 800. Photo by Christopher Mardorf / FEMA. Home destroyed by a tornado that struck a neighborhood on Lamplighter Lane on April 27, 2011. Birmingham, Alabama, July 23, 2011, 3:41 p.m., Canon 5D Mark II, EF 24-105 mm f4.0L IS USM, f/14, 1/400 sec., ISO 400. Photo by Christopher Mardorf / FEMA. 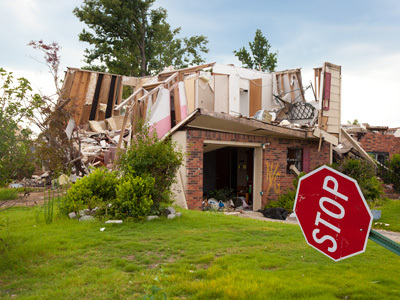 A stop sign and a home destroyed by a tornado that struck a neighborhood on Lamplighter Lane on April 27, 2011. Birmingham, Alabama, July 23, 2011, 3:30 p.m., Canon 5D Mark II, EF 24-105 mm f4.0L IS USM, f/8, 1/200 sec., ISO 400. Photo by Christopher Mardorf / FEMA. Home destroyed by a tornado that struck a neighborhood on Lamplighter Lane on April 27, 2011. Birmingham, Alabama, July 23, 2011, 3:44 p.m., Canon 5D Mark II, EF 24-105 mm f4.0L IS USM, f/9, 1/200 sec., ISO 400. Photo by Christopher Mardorf / FEMA. Household furniture and debris scattered by a tornado that struck a neighborhood on Lamplighter Lane on April 27, 2011. Birmingham, Alabama, July 23, 2011, 3:49 p.m., Canon 5D Mark II, EF 24-105 mm f4.0L IS USM, f/8, 1/400 sec., ISO 400. Photo by Christopher Mardorf / FEMA. Home destroyed by a tornado that struck a neighborhood on Lamplighter Lane on April 27, 2011. Birmingham, Alabama, July 23, 2011, 3:54 p.m., Canon 5D Mark II, EF 24-105 mm f4.0L IS USM, f/14, 1/400 sec., ISO 400. Photo by Christopher Mardorf / FEMA. Collapsed floor of home destroyed by a tornado that struck a neighborhood on Lamplighter Lane on April 27, 2011. Birmingham, Alabama, July 23, 2011, 4:09 p.m., Canon 5D Mark II, EF 24-105 mm f4.0L IS USM, f/10, 1/400 sec., ISO 400. Photo by Christopher Mardorf / FEMA. Home destroyed by a tornado that struck a neighborhood on Mildred Ave. in Pratt City on April 27, 2011. Birmingham, Alabama, July 31, 2011, 7:23 p.m., Canon 5D Mark II, EF 24-105 mm f4.0L IS USM, f/8, 1/125 sec., ISO 800. Photo by Christopher Mardorf / FEMA. Second floor of home destroyed by a tornado that struck a neighborhood on Lamplighter Lane on April 27, 2011. Birmingham, Alabama, July 23, 2011, 4:20 p.m., Canon 5D Mark II, EF 24-105 mm f4.0L IS USM, f/7.1, 1/400 sec., ISO 400. Photo by Christopher Mardorf / FEMA. Home destroyed by a tornado that struck a neighborhood on Lamplighter Lane on April 27, 2011. Birmingham, Alabama, July 23, 2011, 3:39 p.m., Canon 5D Mark II, EF 24-105 mm f4.0L IS USM, f/10, 1/200 sec., ISO 400. Photo by Christopher Mardorf / FEMA. Home destroyed by a tree uprooted by a tornado that struck a neighborhood on Cherry Ave. in Birmingham's Pratt City on April 27, 2011. Birmingham, Alabama, July 17, 2011, 2:19 p.m., Canon PowerShot S95, f/4, 1/200 sec., ISO 80. Photo by Christopher Mardorf / FEMA.